When cooking up one of your favorite old recipes, sometimes adding different spices and/or ingredients to the usual mixture will excite your taste buds, and in the end, bettering the original formula. The same can be said for music, and CRYSTAL BALL is a perfect example. As one of Europe’s hard rock mainstays for better than a decade, after the release of their 2007 album, “Secrets”, the band took a break from recording for a few years. They returned in 2013, after adding a new vocalist to the mix, with the album “Dawnbreaker”, and their musical recipe was perfected. And now in 2015, with renewed energy and passion, along with a brand new album, they are set to prove that some things only get better with time. 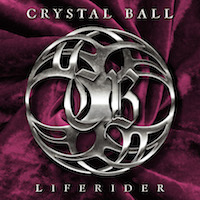 On their 8th studio album, “LifeRider”, CRYSTAL BALL has masterfully blended in a bit more AOR presence with their usual dose of Melodic Heavy Metal and pounding Power Metal elements, creating a hybrid sound that is crafted to please the Metal masses. Consisting Scott Leach on guitar, Markus Flury on guitar, Cris Stone on bass, and Marcel Sardella on drums, and Steven Mageney on vocals, this seriously talented band is offering up, what I believe to be, their best album to date. The opening track, “Mayday”, is a true rock anthem, and with its big infectious chorus, this one will be stuck in your head for days. “Eye To Eye” (featuring the great Noora Louhimo from BATTLE BEAST) is a track that displays all of the elements that have made this band great; power metal guitar chords, massive melody, and powerful lead vocals. On the song “Hold Your Flag”, I picked up a lot of DIO influences; heavy rhythmic guitars and dark melodies, and Mageney’s vocals really shine, summoning a strong “Sacred Heart” vibe. Speaking of Ronnie Jame Dio, they’ve included two songs made a famous by the great one himself, “Sacred Heart” (DIO) and “Sign of the Southern Cross”(BLACK SABBATH), and to be honest, these classic covers gave me chills. But by far, my favorite song on this album is “Gods of Rock”. Opening with a bluesy groove riff, this is one of the heaviest Traditional Heavy Metal songs on this offering (along with “Rock of Life” and “LifeRider”) and will definitely leave you with a stiff neck after just one listen. They do show their softer side on “Bleeding”, an AOR style ballad that showcases Mageney’s lower register to perfection. Great song! There is not a weak moment anywhere to be found on this 15 song release and should, without question, solidify CRYSTAL BALL’s headliner status. “LifeRider” was one of the releases I looked forward to the most in 2015, and it did not disappoint. CRYSTAL BALL will definitely gain traction with this release and should be playing to massive crowds whenever they take the stage. Sometimes there are questions when a successful band changes faces, especially the lead singer, but with two great albums under their belt, and “LifeRider” being one of the best I’ve heard this year, the future looks brighter than ever for this amazing band. If you’re a fan of AOR, Melodic Heavy Metal, or Power Metal, this album comes highly recommended.